"The goal is to treat everyone like a distinct and valuable contributor. Wise leaders take the time to honor and serve individuals to rebuild a school where people feel powerless." 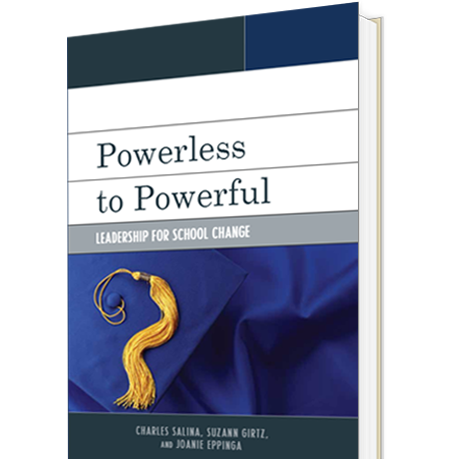 Get a copy of Powerless to Powerful today by clicking below, or call 1-800-462-6420 to order by phone. Throughout the country, educators and administrators face increasing pressure to make sure students pass standardized tests and graduate. 2) don’t know how to achieve. The Powerless to Powerful materials describe the lived experience of school transformation. The underlying principles are applicable to any school, and many of the components are generalizable as well. • Design a course of action to attain a newly defined ideal. Action teams develop a sense of optimism that builds capacity and levels of trust between staff and with administrators. Effective leaders see problems as an opportunity to move toward the mission of the school. Use the school’s collective wisdom to move the school toward the ideal. Developing a school-specific language leads to a focus on possibility rather than deficit. It also increases a sense of belonging. Lesson 7: District Office—Friend or Foe? Help district office members focus on their commitment to doing the work in the building. If leaders describe the work clearly to key district office personnel, support will follow. • Listen to the perspective of support staff. • Act on their wisdom. • Involve them in the change process while building their capacity. It is important to remember that support staff have a unique lens on students and the culture of the school and can play key roles in the turnaround process. or call 1-800-462-6420 to order by phone.